I grew up on a ten-acre hobby farm and we always had a garden. We ate cucumbers fresh and also made canned pickles. Bill’s Aunt Susan taught me how to make refrigerator pickles that are sweet; but I could eat them simply with a little salt. I love cucumbers. Growing up I’m not sure that I ever paid attention to the fact that they are often regarded as a healthy food. They are very low in calories and also contain many vitamins and minerals that make them a healthy choice for cooking and snacking. Cucumbers have a 96% water content which is more nutritious than regular water. We see slices in water at the spas. Drinking it helps in keeping the body hydrated while regulating body temperature. They say it also helps in flushing out the toxins from the body. The juice contains a lot of potassium, magnesium and fiber that work effectively for regulating blood pressure so it’s unfortunate I can’t hardly get Bill to eat them with me! I teased him when I explained recently that I heard they contain silicon and sulphur; therefore a regular intake of cucumber can help promote healthy hair growth! I’m kidding of course and I eat them mostly because of their crisp, refreshing taste. We can grow them here in Minnesota during our summer months, but the states of Florida and California provide U.S. consumers with fresh cucumbers for most of the year (from March through November). Imported cucumbers from Mexico are commonly found in grocery stores during the winter months of December, January, and February. It was interesting to learn that there are actually close to 100 varieties of cucumbers grown in the world. Two of the most common are the English cucumber, and the regular slicer cucumber we use most often in our dishes. I think the extra cost for an English cucumber is worth it, because I prefer few seeds. Even though long, dark green, smooth-skinned garden cucumbers are familiar vegetables in the produce sections of most grocery stores, they actually come in a wide variety of colors, sizes, shapes and textures. You may find white, yellow, and even orange-colored cucumbers, and they may be short, slightly oval, or even round in shape. Their skins can be smooth and thin, or thick and rough. I didn’t know that cucumbers are actually fruits, not vegetables. They belong to the same botanical family as melons (including watermelon and cantaloupe) and squashes (including summer squash, winter squash, zucchini and pumpkin). I love them simply because they are a crispy, refreshing addition to any salad or meal. I had one that needed to be eaten the other day and my son Andrew was over visiting. 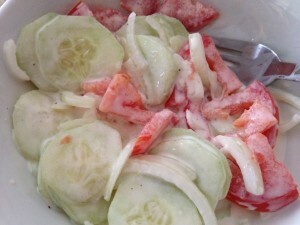 He loves creamy cucumbers, so I thought this would be a great snack! 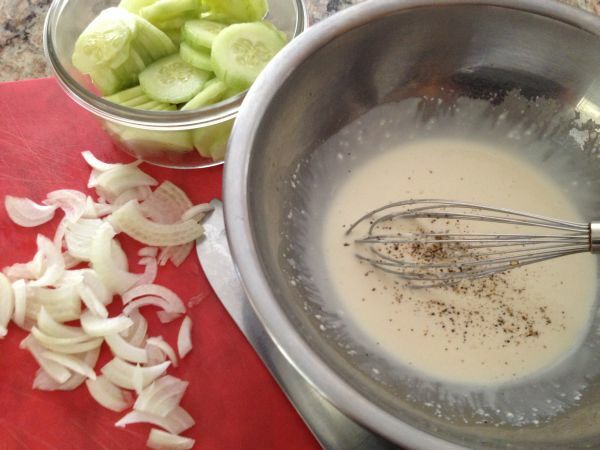 Combine all of the ingredients using a whisk before adding in the onions. 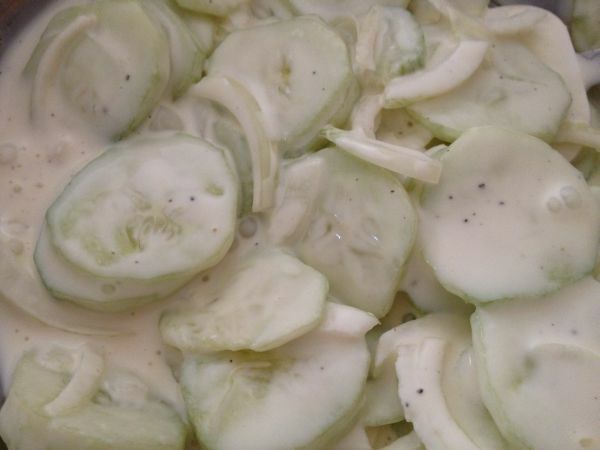 Toss in the cucumbers and serve immediately chilled. Right now fresh garden tomatoes are in season, so I enjoy mixing some in as well to change them up. Andrew “hates tossing all of that good sauce” that is left behind. You can prevent that if you really want to by preparing the cucumbers and onions to separate additional liquid. Do this by mixing the cucumbers and the onions with one to two tablespoons of salt (depending on how many cucumbers you are using) in a bowl. Then pour them into a colander and suspend it over another bowl. Cover the bowl and colander with plastic wrap, and place in the refrigerator to drain for at least four hours. Discard the liquid that collects in the bowl and then when they are ready, roll them up in paper towels and press lightly to remove most of the liquid. Then mix them with the other ingredients.